Destin weather is really warming now and ocean temps pushing close to mid 60s, setting the stage for this year's Cobia run! Destin Cobia Fishing! Looking forward to calmer winds! A short fishing trip out you'll catch some triggerfish! Inshore the catches are good with speckled trout and redfish and sheepshead! Welcome to the Destin Fishing Forums! 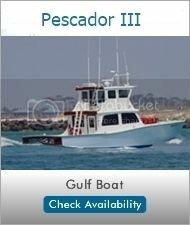 Featuring Destin Fishing Charters, Fishing Reports, Destin Boat Rentals, Vacation Rentals, Local Fishing & Boating Resources and Destin Fishing Community Forums.